Wheat Berries, oh the wonderful Wheat Berries! The other day I made myself a Wheat Berry salad for lunch with no intention of sharing here on the blog, but bite after bite I realized how awesomely good it was and it wouldn’t be nice of me to keep all this goodness to myself. So I had to make it again, tough job but I had to get the pictures. I know awesomely is not really a word, it’s one I like to use when something is super delicious. Something you should know, Wheat Berries aren’t really berries, they’re seeds and they are loaded with fiber and nutrients. 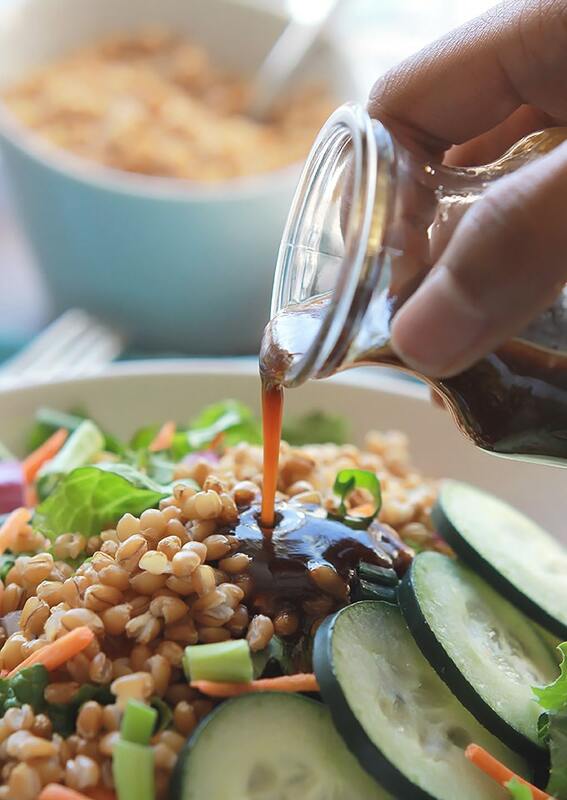 The complex carbohydrates in Wheat Berries help to maintain energy levels without negative effects on the blood sugar levels and they’re the beat kind of carbs, because it’s unrefined unlike other wheat products. Something else you should know about this wonderful carb, it’s super versatile. It can be served as a breakfast cereal, used in energy bars, desserts and in salads like the one I’m sharing with you today. 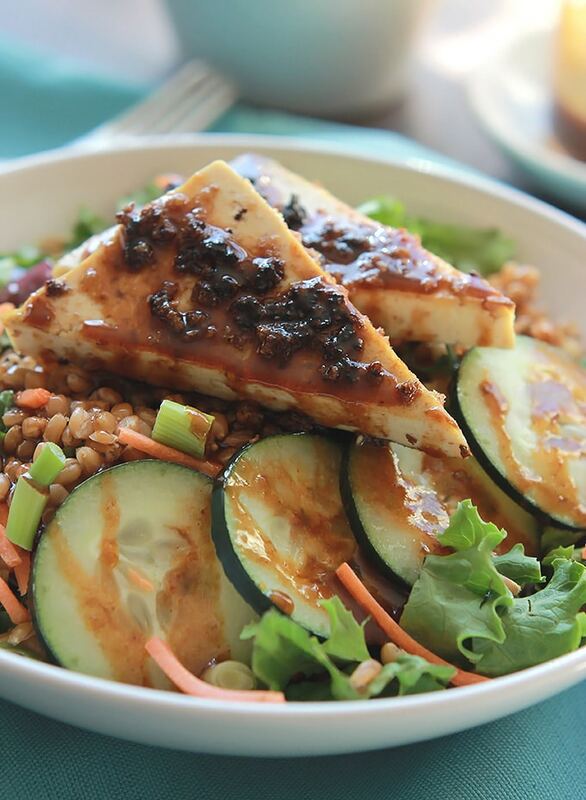 This is a super simple salad, but what makes this salad amazing is the Hoisin Sesame dressing. And yes, it’s as easy to make as the salad. You may notice that I used Coconut Amino in my dressing, I did this because it has less sodium than Tamari or regular soy sauce. 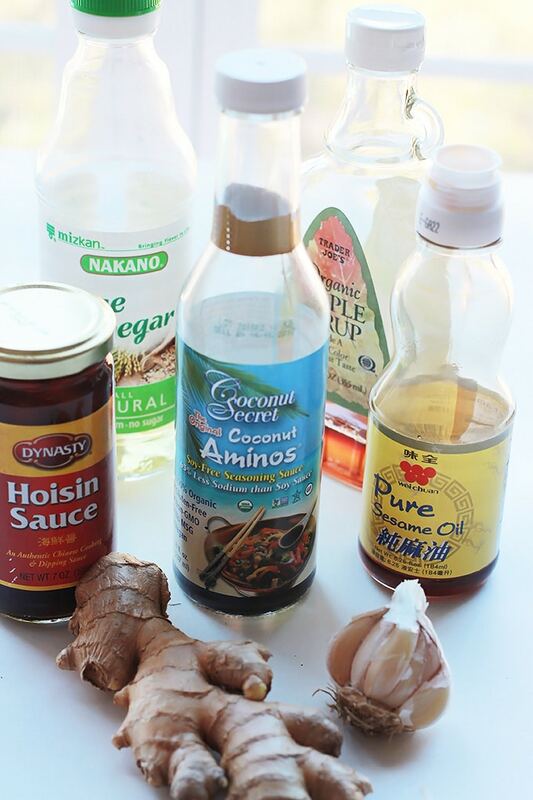 Coconut Aminos is a great replacement for soy sauce for anyone who wants to reduce their sodium intake. As a comparison a reduced sodium Tamari has 710 mg of sodium and Coconut Aminos has only 90 mg, quite a reduction, which is why I like to use in any recipe that calls for soy sauce. I found mine at Whole Foods. 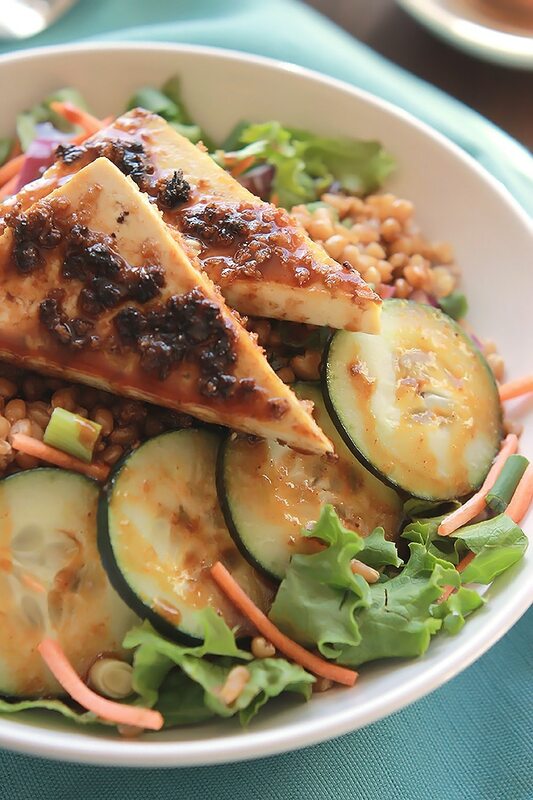 At this point you can enjoy this salad simply dressed with the dressing or do what I did, I added some leftover baked tofu. However if you’re a Pollotarian vegetarian (a vegetarian who eats poultry) or not a vegetarian, you can add chicken. 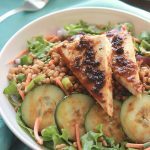 If you’re lucky enough to have leftovers, this salad makes for a perfect energizing lunch the next day. If you like beets you may want to give this one a try – Wheat Berry Beet Salad. 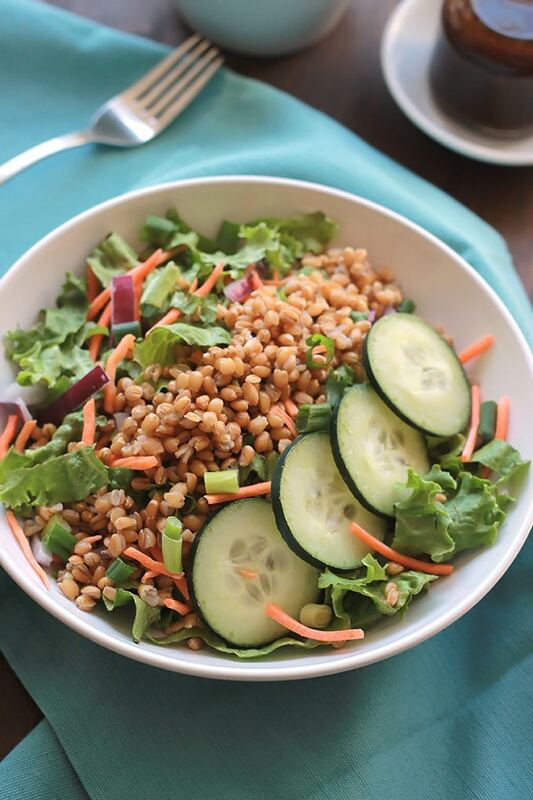 Now on to the Recipe – Asian Wheat Berry Salad! Place wheat berries, four cups of water in small stock pot. Bring to a boil, reduce heat to simmer, and cover with top. Stirring occasionally. When berries have cooked for about 35 minutes, start checking for doneness. Berries should be chewy not tough or hard. Check every 5 to 10 minutes until done. Should take about 40 minutes. Drain berries and transfer to large bowl. 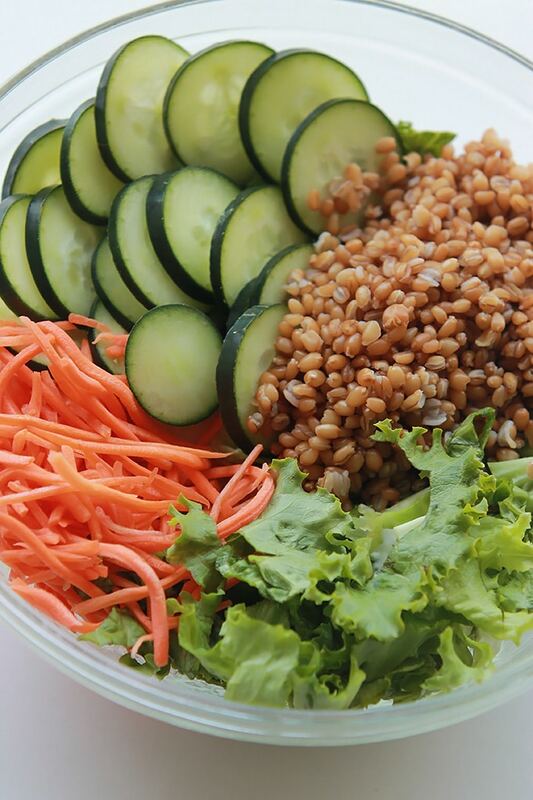 While wheat berries are cooking, prepare veggies and place them in a large bowl. In a small bowl mix together the dressing ingredients. 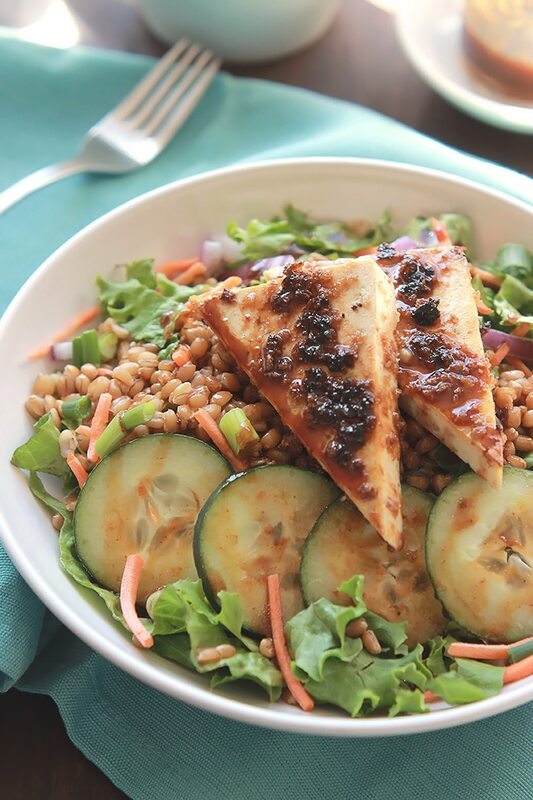 Toss the wheat berries with the veggies, spoon onto serving dish, drizzle with some of the dressing, serve and enjoy! looks awesomely yummylicious! 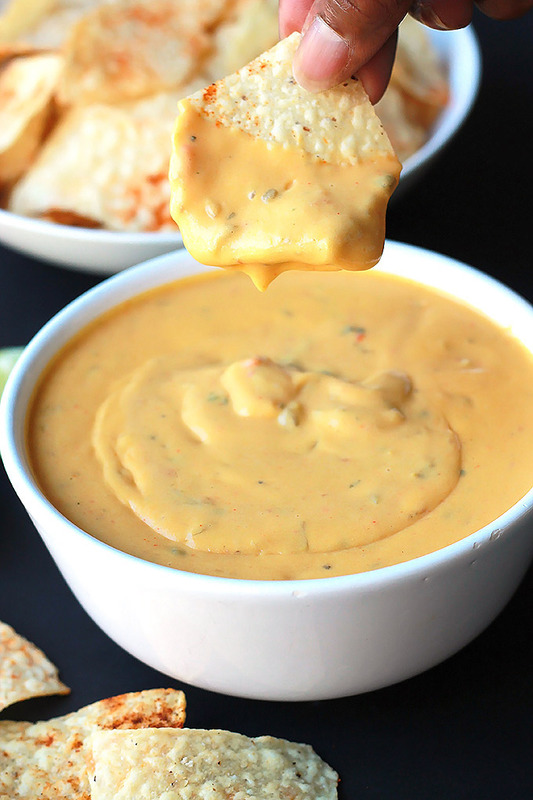 Thanks for deciding to share the recipe with us 🙂 That dressing sounds so good, I want some now! Thanks so much, this happens to be one of my favorite dressings it’s so versatile. This is my kind of salad! 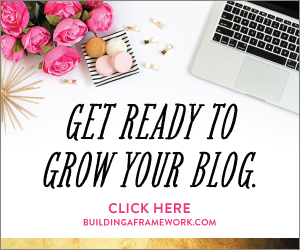 Pinning and can’t wait to try it! Let me know what you think Ginnie.